Blog of the Week: Kat Cupcake! When you stare at a pretty cupcake, you’ve just got to smile. That’s exactly what happened when we stumbled upon Kat Cupcake’s SanrioTown blog! Cupcakes or fairycakes are dainty cakes often wrapped in thin paper or aluminum cups. These charming little cakes are notorious for being manipulative, especially to those who have a sweet tooth—you just can’t resist them! While the blog is not all about cupcakes, it does remind us of one—sweet, charming, with pink frostings and cute decorations. Her blog entries are likely to add a little sprinkle of sweetness into your day! So, to thank Kat Cupcake, we made her journal the Blog of the Week, and we even wrote a cupcake haiku for her! Visit Kat’s blog: Kat Cupcake! Stay sweet and cute and charming, Kat! 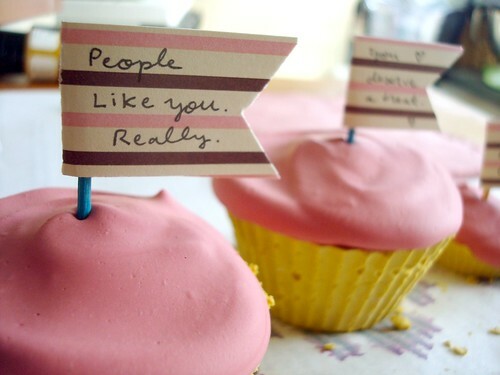 Just like cupcakes.